As a music fan, surely you’ve heard of Alice Cooper, Rob Zombie, Billy Joel, Steve Vai, John Mellencamp, KISS, Katy Perry, Mandy Moore, Toto, Ted Nugent, Rihanna and Ozzy Osbourne. If so, you’ve also heard Liberty DeVitto, Jason Hook, Phil X, Kenny Aronoff, Russell Javors, Rudy Sarzo, Mark Schulman, Glen Sobel, Nita Strauss, Steve Lukather, Paul Bushnell, Jay Graydon, Derek St. Holmes, Chris Johnson, but most likely don’t know their names. 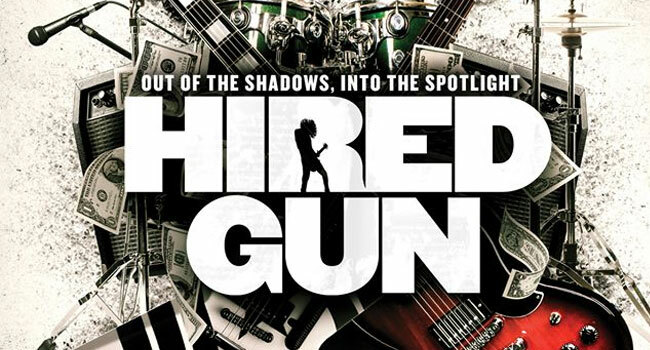 Hired Gun introduces these musicians to the world in a behind the scenes look into the Los Angeles touring and recording scene. “A hired gun is an assassin — the best available musician that gets hired to go on tour to deliver the music for that artist. Nobody will know who he is, but he gets the gig because he’s the elite player,” Five Finger Death Punch and former Mandy Moore and Alice Cooper guitarist and Hired Gun Executive Producer Jason Hook reveals. The 89 minute rock documentary dives deep into what it takes to become one of about twenty “First Call, A-List” musicians in Hollywood. The performers discuss their rise, and sometimes fall, to the top of the list. Many, such as Newsted and DeVitto, recall stories of how they became hired guns to some of the world’s most notable acts. Newsted was hired by Metallica after original bassist Cliff Burton — who Newsted claims was the “Jimi Hendrix of the bass” — died in a bus accident while on tour in 1986. The group hired Newsted, who went on to become a permanent member the next year until his departure in 2001. DeVitto was Joel’s drummer and right hand man for more than thirty years before the pair had a falling out with Joel replacing many long time band members. The film teaches us that being a great musician is just part of getting the gig. Stage presence, chemistry and attitude also matter so much that many have lost gigs because of it. Musicianship is a brother/sisterhood. Musicians bond when the chemistry is right, ultimately producing better music. These “First Call, A-List” musicians know how to serve the songs and artists in which they were hired and not themselves as sometimes being a permanent member allows. “You have to be even more focused that somebody who’s permanently in a band because what you’re doing today reflects on what you’re going to be doing tomorrow,” former Ozzy Osbourne and Quiet Riot bassist Rudy Sarzo states. I am quite fond of music documentaries. They always tend to give more insight into the makeup and chemistry that makes a musician or band which is very intriguing. Hearing the different anecdotes and experiences each of the musicians in Hired Gun speak about is very interesting and often amusing. I’ve been a hired gun before and realized that it isn’t for me because I like to be apart of something that’s more permanent. It works for some and doesn’t for others. However, this film works for anyone who loves music and documentaries! It gives exceptional insight into who these faces are and how important they are to rock and roll! The film comes to Blu-ray and DVD on August 1st and I highly suggest you buy it! I know I will!